Bershka sweater, Monki maxidress, vintage Benetton coat, Les Jumelles cuff. Just a short little outfit post for now! I shopped a bit today; tomorrow I hope to show you what I scored in the sales! Now I'm off to my friend Lisanne's exhibition. Wow, well done. This is such a cosy, classic combination - love the casualness of the cable jumper with maxi. I love your skirt in combination with that sweater! And congrats on the 1000 followers!! You look amazing. I love your jumper. your hair's looking lovely! I want that jumper please. Great look, love the cuff! I absolutely long your long length skirt, and the rusty colour. It's perfect! Completely jealous of your ability to pull it off, they just make me look tiny. I love your jumper too- goes so amazing with the skirt. I really love every outfit from you! Congratulations on reaching 1000 followers! Love this outfit. You're so beautiful. I'm really loving the outdoor outfit photographs :) They add something lovely to them! The cuff gets my vote!! @ The girl that stole the effeil tower: Thank you, it's really great having a temporarily unemployed boyfriend around! Tuesday he starts working fulltime so I guess the outdoor photo's will only be a treat for the weekends. Lovely skirt, congrats on hitting 1,000! congrats! and I'm loving your color combinations lately. You update with lovely outfits so often its hard to keep up! x.x. I love how classic these colours look together. orange and blue and white are perfect for winter. You look lovely, that hat is so cute on you. Your skirt is amazing. Nice blog. Je ziet er prachtig uit. Vind je rok super mooi! I love your cream sweater and the beautiful rust color of the skirt! what a pretty look! Dankje voor je reactie ! Simply beautiful and cozy. I really really adore the hat. oh my, im so in love with all your outfits. Amazing blog!!!!! I tell you again, this hair looks perfect on you! love every thing about it! I love the color and shape of your long skirt! Long skirts are one of my favorite new things to wear! i want that hat, great outfit! i adore this look! your style is flowless. 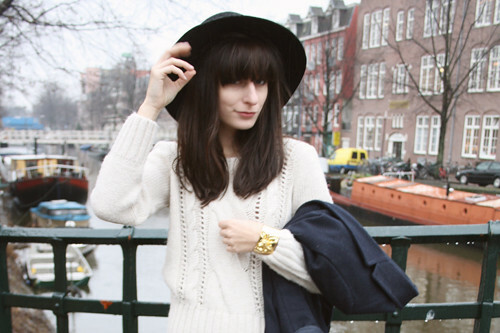 Oh ik moest deze outfit echt opslaan in m'n inspiratiefoldertje, 'k vind hem zo perfect! Vooral die lange rok, en dan hoe je hem hebt gecombineerd. Je blog is zo mooi trouwens, ik hou van de foto's en de muziekjes en de korte stukjes tekst die je telkens schrijft. Happy 1,000+! It's well-deserved, you're such a fashionable lady. DANIEL GOT A FULLTIME JOB AT A TV STATION.